Seventy percent of US farmland is owned by those 65 years and older, with an estimated 400 million acres (slightly less than the size of the Louisiana Purchase) set to change hands in the next 29 years. The looming cliff of farm succession means today’s farmers are taking a radical look at alternatives to ownership. It is critical that we identify ways to move land into the hands and care of next-generation farmers building resilient regional food economies. Those farmers should be able to capitalize a business, sustain a livelihood and build equity, while affording secure access to land. Community land trusts provide regionally based organizations to meet that objective. Indian Line Farm, the first Community Supported Agriculture farm in the US, provides a model for community ownership of land and farmer ownership of home and barns. The farmers hold a long term lease of the land providing security of tenure as they build equity in their buildings and business. To further educate about the critical issue of farmland access, in April of 2014, the Schumacher Center collaborated with the Agrarian Trust project of Greenhorns in convening a symposium on farmland access in the 21st century entitled OUR LAND. Full resources from the event are available below, including recordings of all the speakers and a reading list for further exploration. One of the exciting examples highlighted at the Our Land symposium was the Terre De Liens initiative in France, which has applied many of the community land trust organizing principles. Below is an introductory interview prepared for the symposium by Sjoerd Wartena and Veronique Rioufol from Terre De Liens. As of 2014, the organization held over €48 million Euros worth of land, with the mission of supporting new entrants in organic agriculture. Read a transcript of the interview here. 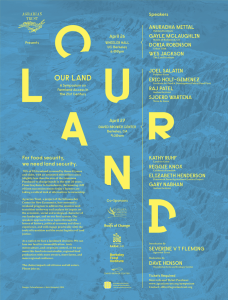 Raj Patel, a writer, activist, and academic, was not able to speak at the Our Land symposium. Here are his thoughts on what he would have said if he had been there.